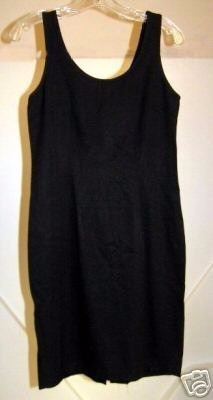 Classy and simple black linen vintage tight sheath sleeveless dress with fit. B-32", W-28", H-34". Always a classic. Excellent buy. I will be selling off various mixed merchandise from my closed consignment shop. All is in excellent condition unless stated otherwise. I describe items to the best of my ability, so please consider complete listing and MEASUREMENTS to save conflict later. We both want a fair and pleasant transaction now and in the future. Please ask if there is any confusion about the listing and I will do my best to answer in a timely manner. Here's hoping for a long and pleasant relationship with you. I want to become your little shop down the block. Drop by and find something cute for yourself. I'll put the tea pot on. Sincerely, Lulu Please enjoy your shopping experience.